AS we write out our Christmas wish lists and rejoice in Spain’s recovering economy, spare a thought for those who are expecting nothing more from Santa this year than a cup of hot soup. For behind the Costa del Sol’s well-to-do holiday façade lies a dark underworld of poverty overshadowed by its swanky high-rise hotels and swept under the carpet by turn-a-blind-eye politicians. As Christmas fast approaches and the winter chill sets in, soup kitchens and homeless shelters prepare for their busiest time of year. This is the flipside of Spain travel agents don’t advertise and local town halls don’t want you to know about. The bitter irony is that Spain has more than enough homes to go around. The country has 3.4 million empty properties – more than any other country on the continent; enough to give shelter to all of Europe’s 4.1 million homeless. Russell’s story is an example of the extent of the problem on the Costa del Sol. Like many Brits, he moved to Spain in 2002 in search of a better life in the sun. Within five years, he was living on the streets and has now been homeless for the past seven years. Russell lives in a twilight zone of poverty: sleeping in a park by Fuengirola castle during the day and walking the town’s streets at night for his own preservation, to avoid being mugged. Recently, he had his passport and social security papers stolen, and is unsure how he will find work again. Twice a week, he lines up for Feed the Hungry’s lunch in Fuengirola’s Lux Mundi building. This Christmas he will be joined by hundreds of thousands of homeless people like him, who rely on soup kitchens and food donations for their survival. The real number of homeless is undocumented and most likely unknown, a sad indictment of the country’s failure to get to grips with the situation. During an Olive Press visit to Feed the Hungry, Russell said his visits are his ‘favourite time of the week’ and that he owes his life to the staff. He added: “We are all here for different reasons. Some of us have drunk too much, some of us have drug problems or family disputes but they don’t care about that here. Over 703,000 kilos of food was collected by Bancosol as part of their annual food drive for homeless organisations. Hundreds of Mercadona supermarkets set up food banks (pictured left) and asked customers to donate one item of their shopping. “They treat us like human beings and they make us feel alive. Although you may not have heard Russell’s story before, it is not uncommon in Spain. An estimated 46% of homeless people in Spain are foreigners, 80% are male and the average age is 42. And over 24% of those living on the streets have been doing so for a period of 10 years or more. Russell will be joined by up to 100 fellow homeless men and women for Feed the Hungry’s Christmas party. They are just one of the charities who will be helping the hungry on the Costa this Christmas. 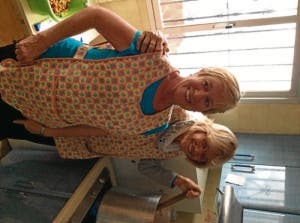 Founder Lesley Berridge – originally from Zimbabwe and a former matron in Johannesburg – set up Feed the Hungry in 2006 after moving to Spain 14 years ago. 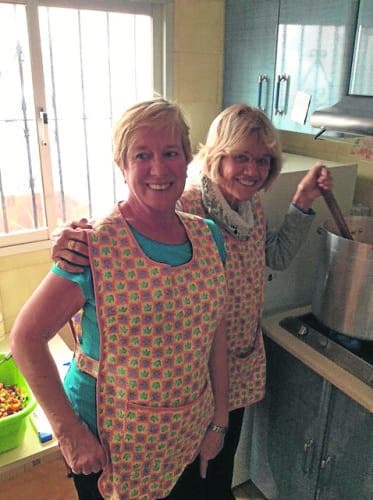 With 20 volunteers working different shifts, Berridge relies on social club La Cala Lions for 85% of funding, and is always grateful for private donations. Berridge said the problem ‘gets significantly worse year after year’ and that the number of homeless people in Spain ‘can no longer be ignored’. “These people are all in need. We don’t ask them about their problems, but if they want to share we are here to listen,” she said. “The government would prefer not to acknowledge the problem but it shouldn’t be ignored. Since Spain’s economic crisis in 2008, a long and severe recession and high unemployment – currently standing at 25% – has impoverished a population which is only just starting to get back on its feet. According to the National Statistics Institute, unemployment is responsible for 63% of homelessness in Spain. Family breakdown and alcohol abuse are other major contributing factors to a problem that is a growing concern. The number of homeless people assisted in Spain by the Catholic charity Caritas has soared by over 30% since 2012, emphasising the escalating problem throughout the country. Perhaps more alarming is the fact that 27% of the country’s children – more than 2.3 million girls and boys – live in, or are on the verge of, abject poverty according to the United Nations Children’s Fund, UNICEF. And this dire situation shows no signs of improving for those most in need. The Spanish government is set to approve a bill on public security which would hit the country’s homeless hardest. The bill is designed to control and punish ‘unsavoury’ behaviour on the streets by fining individuals who are seen to be ‘degrading’ public property. This could relate to €600 fines for those sleeping on park benches or squatting on street corners. Several municipalities in Spain, including Malaga, Sevilla and Granada, already impose sanctions for begging. In Sevilla, the local government recently tried to increase the €300 fine for scavenging in rubbish bins to €750, only backing down in the face of strong opposition. The new bill also removes the possibility of suspending existing drug fines (up to €30,000) for consuming or possessing illegal drugs in a public place. Currently, the fine can be suspended if the individual enters into a rehabilitation programme but that leniency will also be scrapped in the New Year. Judith Sunderland, from Human Rights Watch, described Spain’s approach to homelessness as ‘a punitive approach which undermines social inclusion strategies and a range of basic human rights’. It is easy to spare a thought for the homeless as we tuck into turkey around the family dinner table this Christmas. It’s far harder to emulate the true heroes of this tragic Christmas story – those who get up and do something about it.